We recently commissioned a survey* of small businesses and their employees, and the results were eye-opening: 93% of decision makers and 95% of employees at small businesses agree that Americans will not have enough money saved for retirement. Our commitment to promoting retirement readiness led us to develop a Workplace Savings Solution that gives small businesses and their employees access to easy, affordable retirement benefits when 401(k) isn't the right fit. A 401(k) isn't the right fit for every business. 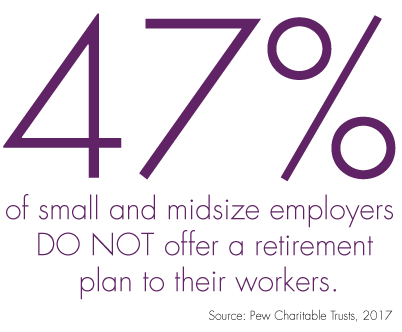 Our survey also showed that 66% of employers say that money is the biggest barrier to providing a retirement benefit, but only 23% have researched programs aside from 401(k) plans. Our Workplace Savings Solutions aim to improve retirement readiness by increasing access to easy, affordable retirement benefits like SIMPLE, SEP and Payroll Deduction IRAs. For employers (including self-employed, sole proprietorships and partnerships) with 100 or fewer employees. Similar to a 401(k), but with less expense and complication. A Simplified Employee Pension IRA is a good option for sole proprietors or small family businesses looking for a retirement plan with tax-deductible contributions, tax-deferred growth, and hassle-free account maintenance. For any size business that wants to offer its employees the opportunity to have deductions taken from their paychecks to contribute to Traditional or Roth IRAs that the employees set up for themselves. All of Millennium Trust’s Workplace Savings Solutions offer great benefits to both the employer and employee. It was created to encourage retirement readiness among the 55 million American workers who do not have access to an employer-sponsored retirement plan. Employee contributions are tax deductible, allowing for the potential for tax-deferred growth. Employer contributions are also tax deductible, and tax credits are available to cover the cost of educating employees about the plan. A plan adoption agreement and supplemental plan documentation can be completed electronically through a streamlined, e-signature process. It’s easy for businesses to establish our Workplace Savings Solution. Employees can be automatically enrolled—and have the option to have their deferral rate automatically increased each year. Employees can access their accounts anytime via the secure, online portal. Employers and employees have access to simplified reporting and account functionality through the online portal. Employers and employees can communicate through a secure messaging center and have the support of a dedicated team of client service experts ready to assist should unique questions arise. I appreciate the special attention that Millennium Trust gives us. It makes it really easy to have total faith in you as our safe harbor. The employer establishes the plan online, with plan adoption completed via eSignature. Employers have access to plan reporting through an online dashboard, and can send messages to employees through a secure messaging center. Once the plan has been established, employees can enroll in the plan online. Once enrolled, employees can self-service their account through their account dashboard and view plan details and account balance, and change deferral rates and investment elections. We are here to help you through this process. Connect with an expert to take advantage of our Workplace Savings Solutions. *The 2018 Millennium Trust Small Business Retirement Survey was conducted among 500 decision makers at companies with less than 150 employees that do not offer any type of retirement savings option, and 500 employees who are working full-time at employers with no retirement savings option between September 28-October 8, 2018. 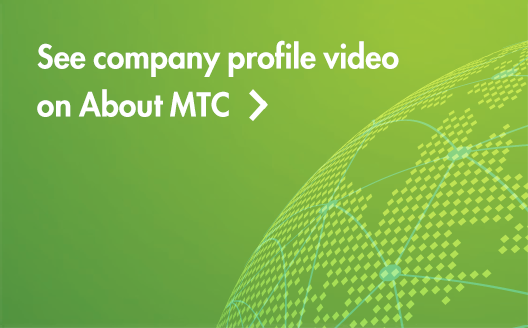 The survey was commissioned by Millennium Trust Company and conducted by CITE Research.